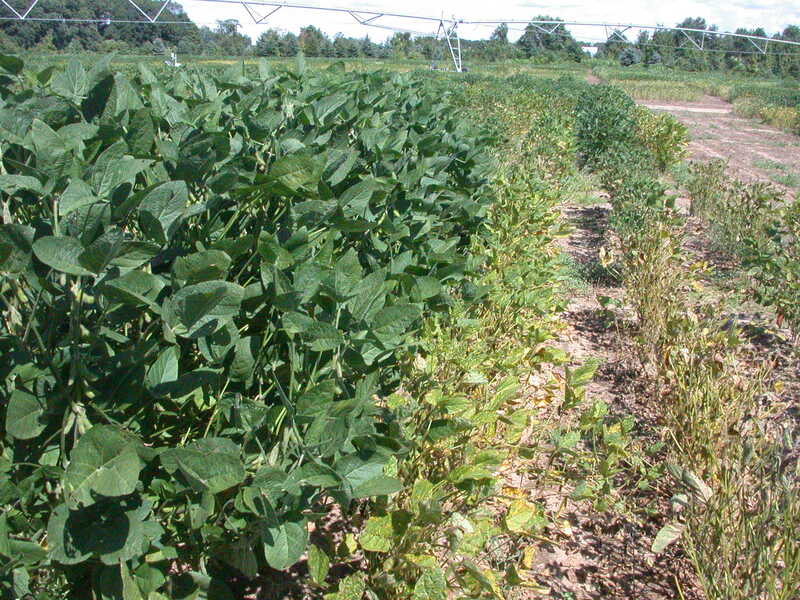 Soybean plants are sensitive to their growing environments. Soybean varieties developed elsewhere may not perform well in Michigan. Challenges faced by Michigan farmers may not be challenges in other states. This research is focused on developing soybean varieties or germplasm that will perform the best in Michigan environments. The long-term objectives of this research are: 1) Develop new soybean varieties with high yield and/or with resistance to one or more of the following diseases or insects: white mold, soybean cyst nematode, sudden death syndrome, and soybean aphids; 2) Develop soybean varieties with acceptable yield and with one or more of the following seed composition traits: high oleic acid content (>70%), low linolenic acid content (<2.5%), low saturated fatty acid content (<7%), high protein content (>43% dry basis), and high oil content (>22% dry basis); and 3) enhance soybean germplasm by incorporating resistance to white mold, soybean cyst nematode, soybean mosaic virus, and soybean aphids into the germplasm adapted to Michigan environments. Varieties with some of the targeted traits were developed and are available for licensing through Michigan Soybean Promotion Committee. For more information, please visit the website at http://www.michigansoybean.org/research/soybean-varieties. Seven sources of resistance to soybean aphids were identified at Michigan State University. The resistance genes in each of these seven sources were identified. The resistance genes are designated as rag1b, rag1c, rag3, Rag3, Rag3b, Rag3c, rag4, and Rag6. All the resistance genes were mapped in the soybean genome and DNA markers closely linked to these resistance genes were identified. Significant interactions were found between certain aphid resistance genes. Differences in effectiveness to control soybean aphids were also found in different combinations of aphid resistance genes. Significant progresses were made to breed these aphid resistance genes into elite soybean germplasm. Seven improved germplasm with aphid resistance were released from the program and are available for licensing through ACCESS Plant Technology, Inc. (contact Greg Gerard at greg@gerardgenetics.com). The most advanced breeding lines with aphid resistance were entered into Michigan commercial variety trials and US regional soybean tests. Some of the resistance genes were stacked together into high yield varieties with resistance to major soybean diseases such as soybean cyst nematode and phytophthora root rot. 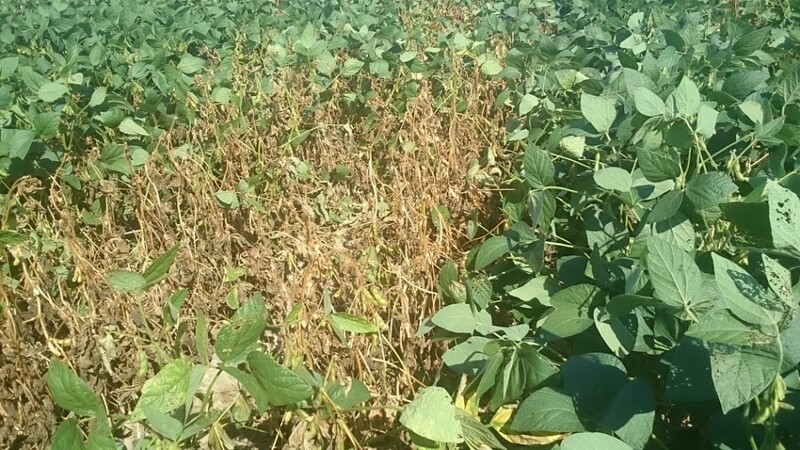 White mold, also called Sclerotinia stem rot, is an important soybean disease in the northern soybean production states in the U.S. Michigan saw widespread white mold in soybeans during the 2008 and 2014 growing seasons. The best way to control this disease is to use soybean varieties with partial resistance to the disease. The goal of this research is to develop soybean varieties or germplasm with high level of resistance to white mold. Varieties with resistance to white mold were developed and are available for licensing (visit http://www.michigansoybean.org/research/soybean-varieties for more information). E11431 is a newly released variety with moderate level of resistance to white mold. It is the highest yielding variety in 2014 Michigan Central Conventional Soybean Performance Trials when white mold was widespread in Michigan. E10151 is another variety with moderate level of resistance to white mold and it was among the top four high yielding varieties in 2014 Michigan Central Conventional Soybean Performance Trials. Difference in white mold susceptibility between a susceptible variety (on the left) and a resistant variety (on the right) in our naturally infected disease nursery at Montcalm, Michgian. 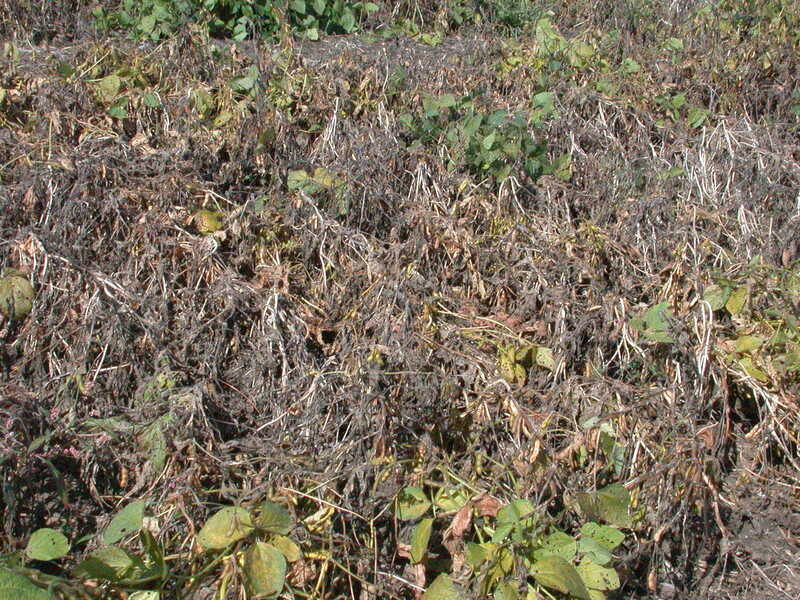 Sudden death syndrome (SDS) can cause soybean yield loss by up to 100%. The disease was first confirmed in Michigan in 2008 and was found throughout Michigan soybean production areas since then. It was a soil-borne disease and fungicides are not an option to control the disease. Using SDS resistant varieties is the most effective and economical method to control the disease. 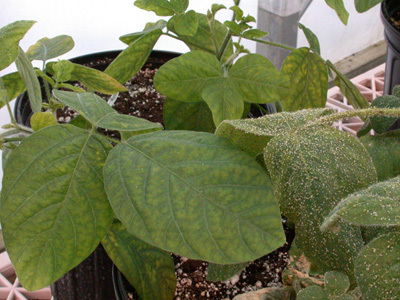 Soybean germplasm with strong resistance to SDS were identified in the MSU breeding program. The objective of this research is to identify the SDS resistance genes from the resistant germplasm and breed the resistance genes into high yield varieties. Difference between an SDS resistant variety (on the left) and an SDS susceptible variety (on the right) in our naturally SDS infected disease nursery at Decatur, Michigan.